This is a request from one of my readers long time back and I am really sorry for posting it so late. Basmati rice has a nice taste and flavor and is preferred for Biryani , pulao and many rice preparations. Today we will learn 4 ways of cooking basmati rice. 1. Wash basmati rice well to remove all the starch and soak it for half an hour. 3. Add water in the ratio 1:2 ( ie) For 1 cup of rice, add 2 cups of water and pressure cook for 3 whistles and switch it off . This method is when you cook rice in a vessel inside the cooker. 4. When the pressure subsides, open the cooker and fluff the rice gently with a fork so that the grains do not break. 5. When you cook directly in the cooker, once the water boils, simmer, close the cooker and cook without weight (Take care not to burn the rice). Use it for any rice preparation . 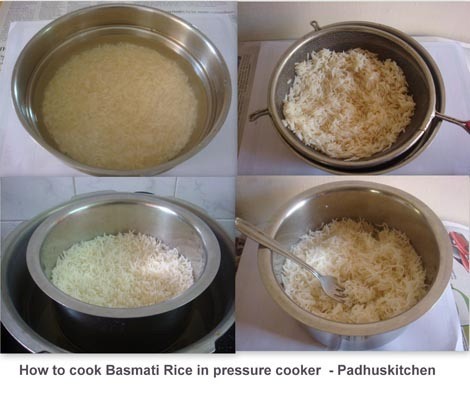 How to cook rice in pressure cooker. 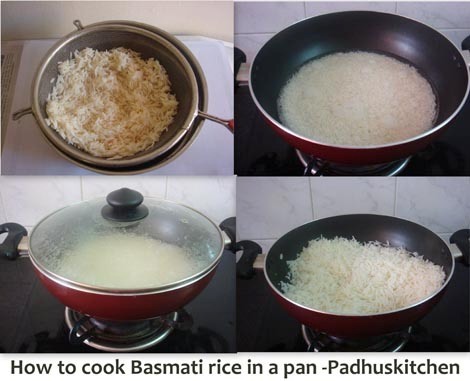 2.How to cook basmati rice in a pan over stove top. Step 1 - Wash, soak rice for 30 minutes and drain the water completely. Step 2 - Bring 2 cups of water to boil. Add drained rice. Step 4 - Once the rice gets cooked, switch off the flame and let it sit for 5 minutes.Then open the lid and fluff the rice with a fork . Wash, soak rice for 30 minutes and drain the water. Add 2 cups of water to 1 cup of rice in the vessel that comes with the rice cooker and switch on the rice cooker. It will switch off automatically once done or else you switch off the rice cooker once the rice is cooked. After washing, soaking and draining the rice, instead of adding correct measurement of water, add more water than required and bring it to boil. Add drained rice, keep the flame low and cook. Once it is cooked, drain the excess water in a colander. Make sure that the water is completely drained before using the rice for any rice preparation. Note - In case if you are not going to use the rice for any sweet preparation, you can add a little salt and all whole spices in it while cooking to give the rice more flavor. Hope you found this post useful, meet you all with more interesting recipes. Wow those were really nice tips to be followed..
useful post for beginners .. Very useful and helpful post.. Thanks for the useful post padhu...though knowing how to prepare there are goof ups some times :P these kind of posts are helpful! Nice basic information for food freshers !! very nice n informative post. I didn't know that rice should be soaked for half hour before cooking. i have to try it for better result. thanks. that is such an informative post! Very useful tip on cooking rice.Thank u. Loved the way you narrate recipes. no hassle, it is simple. An amazing blog and amazing efforts Padma! you are truly talents and I am inspired as its also my dream to start my own kitchen garden with organic veggies. hats off! What are all the whole spices we can use and how to use it? Cooking in the pressure cooker for 3 whistles in low flame or medium flame? You can use 2 cloves, 1 inch cinnamon stick, 1 cardamom .While boiling the water for rice, add all these spices and then add rice. Cook on medium flame when cooking in pressure cooker. I have tried electric rice cooker method.. For 1 cup of normal rice kept 3 cup of water... But still the bottom layer rice sticked in the vessel... During cooking little amount of water came out from stream hole... I didn't kept in warm mode...but the bottom layer rice color was changed .. Can you please give me an idea to get good result?? Add a little more than 3 cups of water and cook the rice. Once the rice is done, remove the vessel from the rice cooker or transfer the rice to a casserole. In this way, you can prevent the rice from getting cooked further in the heat which results in the bottom layer rice getting slightly burnt. Thank you .,It helped me . Thank you.. it helped me a lot padhu. I always messed up with fried rice recipe and after seeing n following your recipe am very glad.. thanks a lot.. love to follow your posts n try as many as recipes..
You are just awesome for taking that one step forward which is totally different and useful when compared to other blogs. That is how to cook, the water ratio and pics of barnstorming rice. Most of the recipes will have only cooking method but your blog has useful tips which is a great boon for beginners like me. While using a pressure cooker does the flame setting matter ? (medium-high/high/low ) or three whistles at any flame setting will do ? If you are cooking with a vessel inside the cooker, you can cook for 3 whistles on medium heat. If you are cooking directly in the cooker, cook on low heat for 1 whistle or even without whistle until the rice absorbs all the water. When cooking directly in the cooker, take care not to burn the rice. Hi Padhu.. I have a question. In method 2 , while cooking in pan, can we cook the veggies first (like say for peas pulao), then add 2 cups of boiling water and rice? Will the rice get cooked properly and absorb all water if veggies are present? Yes, you must cook the veggies and then add boiling water and rice. The rice will get cooked well. I usually follow only this method. Hi padhu,I use to cook in a vessel inside cooker,but when I add veggies or paste for pulao rice become very sticky,not @ all getting fluffy,plz give me an solution.